We can’t have Mount Rushmore open. People might not think Republicans are destroying the country! Despite a well organized plan by South Dakota governor Dennis Daugaard to keep Mount Rushmore open with state funds during the government shutdown last October, the Department of Interior kept the place shuttered for a fortnight before finally relenting. The Department of Interior rebuffed (Daugaard) for two weeks, and I think they did it to make it hurt,” said Jillian Kay Melchior, the author of a superb story in National Review. Well, it had to hurt, because President Obama and Republicans were involved in a high-stakes game of chicken over the shutdown, and we couldn’t have happy faces gazing at Mount Rushmore while Republicans were being blamed for the ruination of mankind. What if other national parks started to open? This could get much too pleasant. We just had contact with a gentleman that came to Mt. Rushmore to memorialize his wife who passed away 1 year ago today. He was aware of the shutdown and had done the responsible thing and checked to see if Rushmore was indeed closed. [After reading this Washington Times article about Daugaard’s efforts to keep the park open, which Hart calls “misleading,”], he headed off to South Dakota. He was quite surprised and angry when he arrived to find us closed. Not only closed, but now [he was] unable to complete the purpose of his trip. Ranger Wollman spoke with the distressed man on the side of the road for quite a length of time. When the contact ended, the gentleman was no longer angry, but obviously upset. Not that the NPS was enthusiastically forthcoming in response Melchior’s Freedom of Information Act request for records. 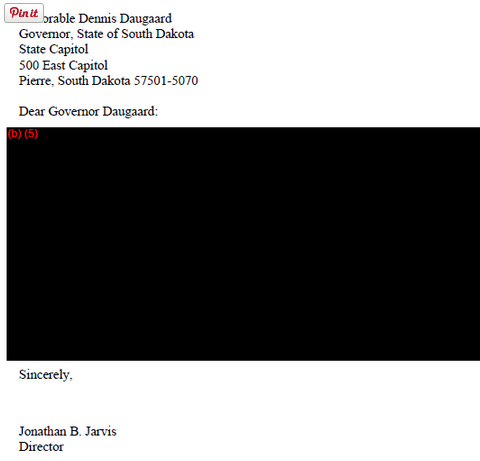 Here’s a letter to governor the Park Service branch of the Openness Administration provided. Viewers, no need to adjust your TV sets. That’s what it looked like. Redaction explosion! The governor’s office gave Melchior the letter instead. But why were they hiding things? Democrats wouldn’t put politics before people. That’s the kind of thing Republicans do! Obama is for the people. To this day, the lofo’s blame Ted Cruz. Mission Accomplished! Kabuki Theater brought to by the media and Congress GOP. The shutdown of our national treasures showed all Americans that the whole of our government is as petty, thin-skinned, and vindictive of their leader. Not only did they shut down the park, they also put out the orange-cone-don’t-park-heres at a turn-off on the side of the road so that casual travelers couldn’t stop and admire our monument from afar. I remember trying to shutdown Mt.Vernon, then they found out it was privately owned. So they shutdown a federally owned road leading up to George Washington’s home. However he spent millions…..of dollars vacationing for him and or his family. No signs, cones, etc. blocked them for seeing or going anywhere they wanted. You can’t take that away no way! What a horrible thought! May that never happen! But you never know with all that rot about “first black president”. Rot indeed! It will never happen. Lizzy,…Dad took us on that same trip many years ago. cabin in Yellowstone that had holes and a pot belly stove for heat. Robber’s Roost in the Badlands. Didn’t get to go as a kid, but we made sure we took our daughter there. Beautiful place! Closing the park might have been blamed on the budget stalemate. It would have been a poor choice of priorities, but it could be defended. When they coned off the viewing turnout on the state road nearby, which is never manned and costs the Feds nothing, it was clear this was Chicago politics at its best. “…disgraceful…” I think that pretty well sums up Obama’s presidency. Refried outrage? Dude–this was ages ago. In a nutshell, Obama is an anti-social misanthrope. His epitaphy should read ‘punish your enemies’…by all means possible. BTW, are the WH tours running full-time now? Can’t seem to find any info, which leads me to believe they are NOT back on track. Nothing would surprise me. …should read ‘epitaph’…not epitaphy, lol. It’s okay – you had an epiphany about his epitaph! I’ll ask when I send a reply to the e-mail my BFF, “Michelle”, just sent asking me to help “Barack” by sending him $3.00. I had no idea the Os were in such financial straights until this morning. I’ll ask about the WH tours, and of course, send my suggestions on how they might better tend their percarious financials. Ha, how did your name get on THAT list, srdem? I’m sure it’s an exclusive club…. Answer; srDEM65. I am a registered Dem. From birth I think. My dear parents probably registered me on the Dem rolls at birth along with a birth certificate. Union label! Roosevelt! JFK! Corruption! I have long since had my own epiphany, but thought I might help our country more as a dissenting Dem, than a turn-coat Repub. One good turn deserves another. I might just have a cache of $3 dollar bills left over from my prankster kidlets. Will be happy to forward them on to Her Witchiness. Why did Obama’s birth cert. come to mind while I was reading that letter?